The Power Distribution Unit 12 (PDU-12) provides twelve power outputs to Thinklogical products requiring a +5 volt external DC power input, eliminating the need for individual wall-wart style power adapters. Each unit contains two redundant, hot-swappable AC/DC power supplies capable of load sharing, which plug into the rear of the chassis and have removable AC line cords. The rear panel features twelve DC Locking Power Jacks with a .100” diameter center pin. Each +5 volt output is capable of sourcing +5 volts ± .25volts at a maximum of 4 amps. Power for Velocitydvi, Camera Fiber-Link Extenders, and USB 2.0 Extenders. 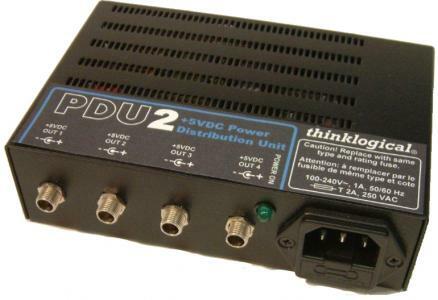 The Thinklogical Power Distribution Unit 2 (PDU2) is a +5 V DC power supply that provides power for up to four devices. The PDU is designed as a desktop device. Increase Productivity while Decreasing Operational Costs. The ability to remotely manage equipment is one of the most critical aspects of modern IT infrastructure. Thinklogical’s PDU 4/4 – Remote Power Distribution Unit offers power management for up to eight devices (computers, hubs, routers, etc.) and works in conjunction with Thinklogical’s Secure Console Servers. The PDU offers effective out-of-band management by enabling users to power cycle, hard boot, and control power to individual servers through console management sessions. Power restarts can be sequenced using programmed time delays to minimize surge or allow drive spin-up time. Signal management is a critical element of effective workflow communication. There’s a reason we’re the #1 choice of so many IT professionals. Contact us and experience why. We’re here to assist you with optimizing your power backup, distribution, and measurement for a more efficient server room. One of our data center solutions specialists will work together with you to find the optimal solution for your system.